If you've been a follower on my blog for some time now, you'll probably know that I've been very fond of Hot Topic's Disney·Pixar themed shirts over the last year or so. I really enjoy how they feel and fit and I appreciate the unique, minimal designs that they often choose to utilize. 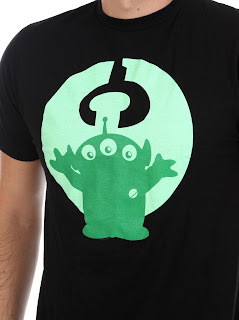 One of my recent additions to my [Hot Topic] Pixar shirts collection is this fantastic Toy Story Pizza Planet Alien "The Claw" tee! Love the simplistic look. If you want to pick this up for your collection, you can still find it online HERE. Highly recommended for Toy Story fans - definitely get it while it's around!